Mr. Davis is President of Corporate Compensation Plans, Inc., in Danbury, CT. Connect with him by phone 916-594-9720 or e-mail: [email protected]. When we think about retirement planning and funding our retirement programs, we think about protecting and adding to our nest eggs – our wealth accumulation programs. When life goes well the goal is to have that nest egg grow to an amount sufficient to fund our needs through the remainder of our lives. It is towards that goal that almost all our planning and efforts are directed, such as properly funding wealth accumulation options such as 401k, 403b, annuities, Roth IRAs, IRAs, SEP IRAs, and non-qualified deferred compensation plan contributions. Of course, you have also planned for the curve balls that can get thrown your way by having a disability insurance plan to fund your lost income and a long-term care policy to fund the expenses of extended health care needs. However, if you turn your back now and think you are done, you have left your retirement at risk: the substantial risk that a career-ending accident or illness – or even a stroke, as 19% of strokes happen to people younger than age 55 – will prevent you from returning to work and funding those carefully constructed wealth accumulation plans. What then? You may have your disability policy to supplement your income, or a portion of it, and a long-term care policy should you need extended care. Everything may seem to be in place and you think you are set and your plans are properly implemented. I wish this were true but, unfortunately, there remains a gap in your plan and you do not have you and your family do not have adequate financial protection should a career ending event occur. Your inability to continue to work implodes your retirement planning – all that planning down to the last penny of contributions, the build-up of the plan amounts and projected percentages of capital to be used during each year of retirement are at risk. Once you stop working, your retirement contributions stop. And if you stopped working due to a career-ending illness or accident your income replacement policy is not sufficient to continue retirement contributions. It is that simple – you stop working and you stop contributing to your retirement nest egg. The flip side of wealth accumulation is wealth preservation – the protection of existing assets and the assets projected to be in your retirement account when you will need them the most – when disability payments cease at age 65. A complete retirement plan is not about you – it’s about your family! The hard truth is that should you have a career-ending accident or illness, your needs will be taken care of. The needs not taken care of will be those of your family who will act as your caregivers or will fund your care. This care is provided at the same time the income of the family is reduced and the expenses increased. The real problem will truly emerge at age 65 – this is when your disability insurance payments cease and that carefully constructed retirement plan – to which your contributions have been decimated – commence. Unfortunately, since you stopped contributing to your retirement, those plans now cannot fund the needs of your family. A 44 year old physician earns $300,000 per year and contributes $25,000 per year in total retirement contributions. Should an event occur that prevents her from continuing to work in her own occupation she will not contribute $500,000 to her retirement programs and will live on the current income replacement disability insurance program. A 57 year old attorney earns $450,000 per year and contributes $75,000 per year in total retirement contributions. Should an event occur that prevents him from continuing to work in his own occupation he will not contribute $600,000 to his retirement programs and will live on the current income replacement disability insurance program. You are now able to acquire a tax-free sum payment equal to the value of ALL your projected retirement plan contributions to age sixty-five should you become disabled through a new disability insurance plan designed to fund your lost retirement plan contributions. This is a benefit whereby the insured is able to determine the amount of retirement contributions that will be lost and add in some other expenses that may be necessary to pay down – for the financial well being of their family. Once that number is self determined, they can choose a lump sum one-time payment amount that meets their needs. This may be as small as $250,000 or may be over $3,000,000. The goal is to replace the money that will be lost from lost retirement plan contributions and provide additional income to guarantee that the family’s lifestyle does not change. This new disability plan is offered on a guaranteed issue basis – there is no medical exam and no financial underwriting. The value of creating such groups is that many, if not most, of the members have in the past been unable to participate in guaranteed issue offerings This solution provides these individuals the discounted pricing and absence of underwriting, both medical and financial, that has only been available to employees of larger companies. When a career-ending accident or illness prevents you from working in your profession, many things change. 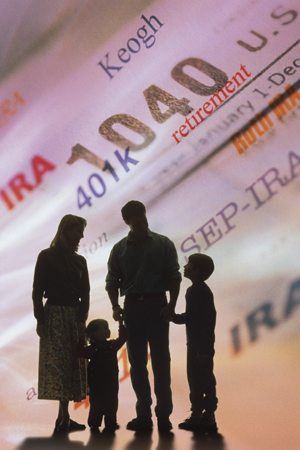 This first change is that sufficient income to meet the family’s needs is no longer coming into the home; the second change is that your retirement accounts will no longer accumulate from expected contributions and will quickly deplete as they now must be used to supplement you and your family’s lifestyle. The 45 year old physician described above would lose millions of dollars in lost income and retirement assets as of age 65. The 57 year old attorney described above would lose over $600,000 in lost income and retirement assets as of age 65. This substantial change in income and available assets will cause difficult decisions for the family and alter the lifestyle that so much effort was put into to maintain. These people had very good existing disability benefits, but those benefits alone are not sufficient to prevent catastrophic losses to the family’s financial security. An additional benefit to protect the retirement, paid as a lump sum, one-time payment of even $500,000 can replenish the lost retirement account and once invested can help to create a more comfortable retirement. Furthermore, this additional income can be used for emergency expenses just as families often access their retirement accounts for such purposes. These results seem astounding but they are every day scenarios for those that did not realize the issue of wealth protection in addition to wealth creation; often times realizing when it’s too late. Protecting the accumulation of retirement assets is equally important to the protection and security of you and your family’s needs as income replacement. Disability insurance benefits cease at age 65, just when we are seeking to access our retirement accounts. The loss of income and the loss of retirement accumulations devastates the family’s retirement – often forcing the sale of assets and a diminished lifestyle. Protecting one’s retirement assets can be achieved on a guaranteed issue basis no medical or financial underwriting – and at no cost to employers or affinity groups – such benefits can be enrolled online and on a voluntary basis.